Is Applesauce Good for You? Applesauce is a popular snack. Having a serving of applesauce a few times a week will save you from the hassle of eating apples. You can get all health benefits associated with apples from applesauce. But you may still wonder is applesauce good for you. Let' find out more about it. Yes, it is good for you. Eating a cup of unsweetened applesauce will provide you with 100 calories. Even though it is low in calories, it is incredibly filling and helps prevent hunger pangs. The calories found in applesauce do not come from fat but come from sugar in the form of fructose. If you want to enjoy its health benefits without having to worry about putting on weight, you'd better choose unsweetened varieties of applesauce. Is applesauce good for you? To get a clearer picture, it is important to learn more about what nutrients are available in applesauce. Fiber: You get about 2.7g of fiber from a cup of unsweetened applesauce, and it equals 11% of your recommended daily intake of fiber. It is a rich source of soluble fiber, which dissolves in your body to maintain healthy cholesterol and blood sugar levels. It also contains a special type of soluble fiber called pectin that can reduce cholesterol level efficiently. Vitamin C: Applesauce is a healthy addition to your diet mainly because it is rich in vitamin C. Many fruits are good sources of vitamin C, but not many can beat applesauce, as it provides you with up to 80% of your recommended daily intake of vitamin C.
Beneficial Phytochemicals: Apples are loaded with beneficial phytochemicals, including chlorogenic acid, catechins, quercetin, and phloridzin. These phytochemicals act as antioxidants which can prevent oxidative damage. They help lower your risk for Alzheimer's disease, asthma, heart disease, cancer, and type-2 diabetes. Potassium: You can increase your potassium intake by including applesauce in your diet. A cup of apples provides you with 134 mg of potassium, whereas a cup of applesauce offers about 184 mg of potassium. Your body needs potassium for healthy muscle contraction and heart functioning. Carbohydrates: If you are trying to build muscles, you need energy to complete your workout session. Carbs is a main source of energy and applesauce provides you with a good amount of it. 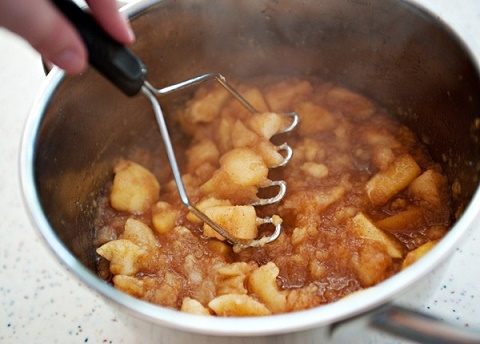 Use as a fat replacement: Using applesauce in your sweet treats is one simple way to make them healthy. You can replace half of liquid fat required for a specific recipe with applesauce to lower the fat content and make your sweet treat much more healthier. Doing this will also increase the amount of minerals and vitamins in your dish. Use as an ingredient: You can always enjoy applesauce alone to get several benefits, but you can also use it as an ingredient in many dishes. You can always add it to your baked goods to lighten the caloric density of those dishes. All you have to do is to replace half of recipe's oil with applesauce. While adding a special flavor to your dishes, it will also add fiber and reduce overall calories. 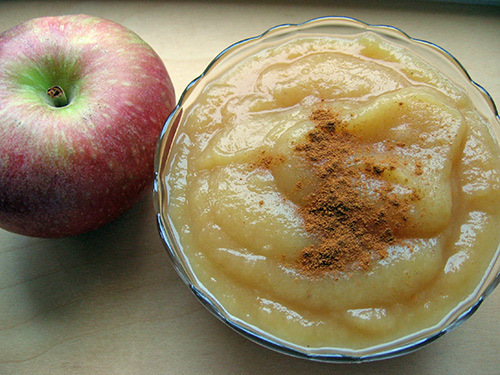 There are a number of different ways to include applesauce in your diet. For instance, you can make silver dollar applesauce pancakes. Alternatively, you can make muffins or top cooked pork chops. Substituting applesauce for apple chunks will make thing even more delicious. The simplest option is to have a bowl of chilled applesauce for breakfast, and you can also have it as a side dish for lunch or dinner. If you are really interested in including applesauce in your diet, the homemade one is probably the best choice, especially if it is unsweetened and made by unpeeled apples. You can avoid sugar by using cinnamon to enhance the sweetness. Going for commercial applesauce is not so good because it may be made by unpeeled apples, which greatly reduces the amount of phytochemicals and fiber. Besides, commercial applesauce may contain lots of sugar. Is Melon Good for You?